Steel Circus is the solar system's largest sporting event. Players control one of several champions with unique abilities in competitive online matches. Throw, pass, tackle and dodge to score goals in a game where skill, team play, and tactical decision-making pave the road to victory! Closed Alpha Test #3 Coming April 4th! We are delighted to introduce Shani, a new champion for our next Closed Alpha test! Be sure to check out her skills and let us know what you think on Discord! If you still don't have a key, this is the time! Go to http://www.playsteelcircus.com and get a key now! 6. For another match press "Quickplay"
Tip: Check out the "Champions" menu in the main menu to read up on the abilities and advantages of each Champion. 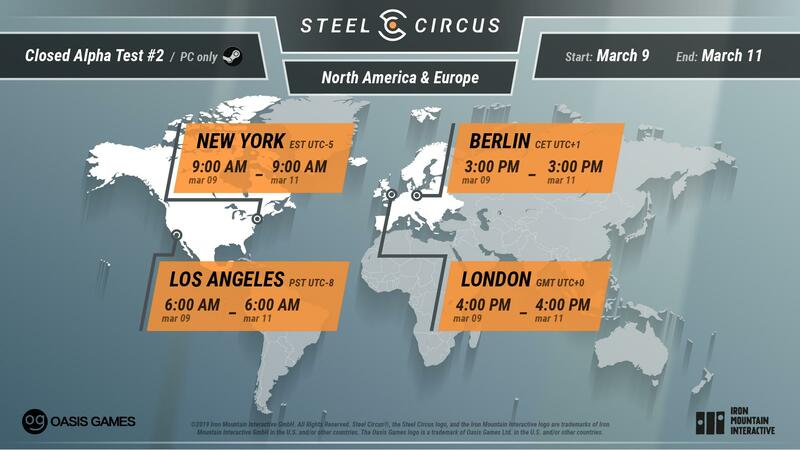 If you want to get in touch with the developers you can join the Steel Circus Discord channel: https://discord.gg/cMGsJ7Z and read up on the latest developments and insights. If you want to report a bug, please report it to the public Steel Circus BugDB on GitHub: https://github.com/imi-gmbh/Steel-Circus-Public-Bug-Database/issues or in the “Bug-Report” channel on Discord. Hope you have a good time and let us know what you think. Closed Alpha Test #2 Coming March 9th! We are very excited to announce that the second round of our Closed Alpha Test will be held on March 9th, with servers open for 48 hours this time! If you still don't have a key, this is the time! Go to http://www.playsteelcircus.com and get a key now! Please note that this round will be a regional test with servers spawned throughout North America and Europe only. If you are not in these regions, there will be a high ping and your gameplay experience will be negatively impacted. What were we working on? Thanks to our amazing community, after the first CAT test, we received a lot of feedback and we’ve been working on many different improvements. Please remember to check out our Developer Notes #1. Also, we have a surprise for you! We’ve collected some of the best CAT #1 moments from our amazing Twitch streamers and Youtubers, and compiled them into one awesome video. Check it out below! A big thank you to all of our content creators! We are planning to collect best moments during CAT #2 as well, so feel free to stream/make videos, and tag us! How can I buy Steel circus? We are planning to release Steel Circus on PC first as a premium (mid-prized) title at early access but our long term plan is to offer the game as a free-to-play title. More information to be announced. 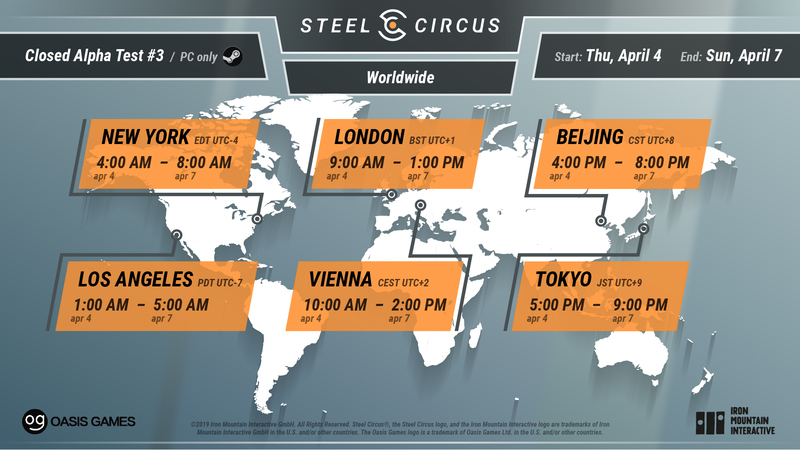 If you want to get in touch with the developers you can join the Steel Circus Discord channel: http://discord.gg/cMGsJ7Z and read up on the latest developments and insights. If you want to report a bug, please report it to the public Steel Circus BugDB on GitHub: http://github.com/imi-gmbh/Steel-Circus-Public-Bug-Database/issues or in the “Bug-Report” channel on Discord. Closed Alpha Tests for Steel Circus has begun! and we need your help! Become one of our very first players and sign up here: https://www.playsteelcircus.com/AlphaTest We look forward to seeing you in-game and hearing your valuable feedback! Stay tuned for upcoming announcements. Currently, our goal is to enter Early Access on Steam early this year. Currently, the game is in the alpha testing stage. Our next big milestone is to enter Early Access early this year. The easiest way to stay up-to-date is to join the Steel Circus Discord community, follow Steel Circus on social media, and to sign up to our newsletter, where you’ll be the first to know about testing events, giveaways, and the latest news about Steel Circus. Can I expect regular updates? Absolutely, we have big plans to support “Steel Circus” with regular content updates and new features. There will be new champions, arenas, customizations and most importantly competitive events in the future. It’s our goal to include our players in the future progress of Steel Circus and we’re happy to invite all of you to join on us on Discord and share your thoughts, feedback and suggestions! How many champions will there be in the final game? We’re currently working on 5-7 champions during our upcoming testing phase, and our long-term goal as we approach launch next year is to feature 15 to 20+ champions which we’ll regularly introduce to the game, along with new content updates like customization features and new arenas. During this phase of development, we’re focused primarily on delivering a balanced and fair gameplay experience for our players while introducing new content. How many Arenas can I expect? There will be 5 to 10 factions in Steel Circus, each represented with at least one arena. We also plan on having multiple playfields with different layouts and gameplay elements per arena. For Early Access we plan on having 2 arenas with 2 variations each, meaning 4 different arena playfields. What about other game modes? For now we’re concentrating on the core competitive game mode, with our goal being to make gameplay as fun and interesting as possible from your 1st to your 1000th match. That being said we do have plans to add different game modes that add exciting variations of the core gameplay after Early Access. What will be the business model of Steel Circus? During Early Access there will be a few premium packages available to purchase Steel Circus. All packages will include every current and future champion for the lifetime of the game. In addition to that, there will be in-game transactions for unique cosmetic content which will not affect the core mechanics of the game. We will not include any mechanic affecting paid features, or any form of pay to win or loot boxes in the game. The game is set in the year 2350. After a long period of open conflict and war there is frail peace in the solar system. Every year the most powerful factions meet as the Solar Council behind closed doors to discuss politics while Champions, representatives of each Faction, compete against each other at the Steel Circus in front of roaring crowds. Steel Circus is a gigantic spectacle every soul in the solar system is watching closely. Champions are celebrated heroes, beacons of hope and a demonstration of power as they clash in the arena. Before each match, you need to choose a champion to play. Each champion has a unique playstyle and two special abilities. Some champions are great at supporting their team with buffs and heals while others are brawling powerhouses or specialists in wearing their opponents down from afar.